The spread of Islam stimulated the development of a wide range of science and technology founded upon a legacy from the ancient world. This exhibition brings together a number of objects of Islamic origin that provide insight into some of the achievements of Islamic science. For Muslims the Qur'an establishes God's Law and reveals the true nature of reality. It is said to contain all knowledge and thus the acquisition of knowledge is seen as a religious act. Muslim scholars did not separate areas of learning such as medicine, mathematics and literature; instead, each was regarded as a single part of a unified whole truth. Astronomy and mathematics enjoyed a privleged status in the hierarchy of Islamic sciences providing insight into the divinely inspired nature of the universe as well as solutions to everyday practical problems. 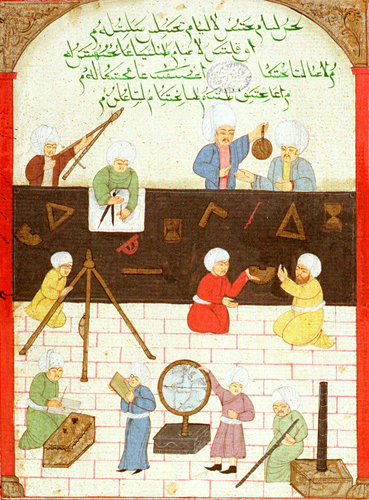 Muslim astronomers established large observatories and developed instruments such as the astrolabe to a high degree of accuracy and sophistication. Astronomical data was essential to establish the Muslim calendar, based on lunar cycles, and the dates of religious festivals.